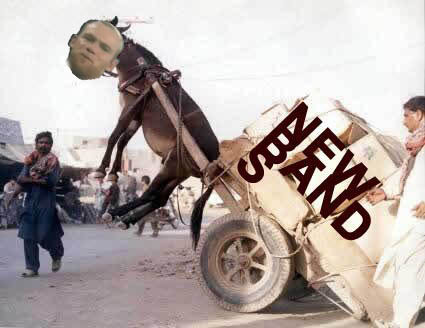 Wayne Rooney is all over the news again, and I’m bored with his grumpy quasi-teen antics. It’s hard enough to enjoy the sight of 22 millionaires kicking a ball around any more, let alone comprehend the whining of one that he’s not getting paid enough. FIRST! Love Lake are the kind of band that gives me hope for guitar music, the death/dearth of which has been discussed ad nauseum here on ANBAD. If guitar music is to survive – or at least crawl out of this deep slump – then bands who pick up their first real six-strings are going to have to make music as nuanced and delightfully inventive as this Love Lake‘s Ghost. Ghost has all the traits of a good song; and like gnarls on a tree, oddities punctuate an otherwise usual structure. So this song ambles along with jaunty purpose, and the listener is gladly swept along. Love Lake – thank you for giving me hope. What a great song. It’s a free download, so fill your boots (and then buy the great album). SECOND! Kitty The Lion‘s singer has a broad Scottish accent, which indicates to this sharp mind that this may not be the first band actually fronted by a lion. But just imagine it for a second, as you listen to these sprightly, charming tunes, and wonder at the possibilities. Lovely songs, sung sweetly. THIRD! La Sera is Katy Goodman, but she gets so tired of typing a medium-length name, and so has invented one with only six letters. Clever. She’s also created a slew of shimmering and fluffy pop songs like Never Come Around, which sounds like Jesus and Mary Chain with all the fuzz pedals unplugged. Yum. FOURTH! A Sofa Made Of Dust sounds like it was written and recorded over a six-hour period of heavy drinking. Wait – it was. That would explain everything – the creepy, backwards, manic chatter, the distorted sampling, the air of semi-connectivity to a weird, tempting world. Mmmm, wine. Great, unusual stuff. Posted on October 20, 2010 by Joe Sparrow. This entry was posted in "Brilliant" Bands, Headline, Today's New Band. Bookmark the permalink. ← Weekend – Metallic, Howling Clouds. And Fußball. I love this album. Infectious. And for once, vocals not drowned in reverb.